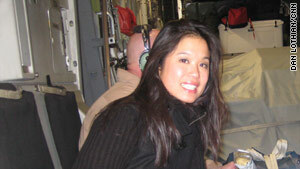 CNN White House producer Xuan Thai during the 14-hour C-17 flight to Iraq. Editor's note: CNN White House correspondent Dan Lothian and producer Xuan Thai served as the pool for Vice President Biden's recent trip to Iraq, filing reports for all the networks. Here are Thai's observations of a trip that took them from Washington to Baghdad and back. Washington (CNN) -- Once the Black Hawk helicopter was in the air, I saw the beauty of Baghdad. The city was alive. It was twinkling with the lights of homes, businesses, and the headlights of cars. In an odd way, it reminded me of Southern California. Everything from the cool night air and palm trees to the low-rise buildings with stucco siding and the pools and fountains in some of the backyards. Even the traffic was familiar, right down to the smog in the air from the oil refinery. And there was more. An amusement park sat in the middle of the city, complete with a Ferris wheel and other rides that were outlined with colored Christmas lights. There were lit signs for the shops that were still open. The bird's-eye view completely defied my expectations for the city. Perhaps naively, I had thought that all I would see would be rubble, buildings in ruin or under reconstruction, craters from suicide bombers and empty streets. Instead, what I saw from those few hundred feet in the air was a vibrant city bustling with life. We were on a secret trip with Vice President Biden, leaving late on a Thursday night and arriving nearly 14 hours later at a Baghdad landing strip. There we boarded U.S. military Black Hawk helicopters for a quick flight over the city to the Green Zone, the fortified international area of the city where the U.S. embassy is. We were told that we had to wear flak jackets and helmets, to remember which seat we were in so we could be accounted for quickly on future helicopter rides, and no flash photography once in the air; the flash would easily give away our location, we were told. On the ground I had nervously wondered what you would want to take a picture of at night over a war-torn city -- in the air, it was a picture to behold. The Black Hawk ride itself was an experience like nothing I'd ever had. I've flown in military helicopters before but those were larger Chinooks. This was a far more nimble machine. One second we were on the ground and the next we were high in the air, cruising over the city with no lights on, just the whir-thump-thump of the rotors, the view of the city, and a young man at the trigger of a very large machine gun, just in case -- a reminder this was no joyride. When we landed in the Green Zone, a motorcade of SUVs, vans and Humvees -- all armored -- took us to where most of our work would be -- the U.S. embassy compound. During the motorcade ride, a young diplomatic security agent from the State Department gave us a few pieces of advice. He told us when to wear our flak jackets, how we should duck into the bunkers if danger came and not to leave ourselves exposed between the open buildings. Finally, he warned that if we heard a siren go off in the middle of the night, we must find cover or run into the kitchen area of our room and lie prone to avoid injury by rockets that may come our way. Once we arrived at the embassy, I saw a beautiful complex of buildings. It almost looked like a college campus, if you could crop out the armored vehicles and Humvees in the parking lot and the bunkers in the open fields. And instead of students running around, we saw young soldiers from various countries coming from a soccer match. In the place of military gear we saw soccer uniforms. Grills sat out for use and signs were posted for movie nights and exercise groups. The atmosphere was relaxed and almost lulled you into believing that things may be "normal" again in Baghdad. But there are reminders that things aren't right. In the days immediately after our visit to the country, a series of bombs went off outside foreign hotels and police headquarters, reminding me that Baghdad was as far away from my first impressions as the distance that lies between me and the city now.